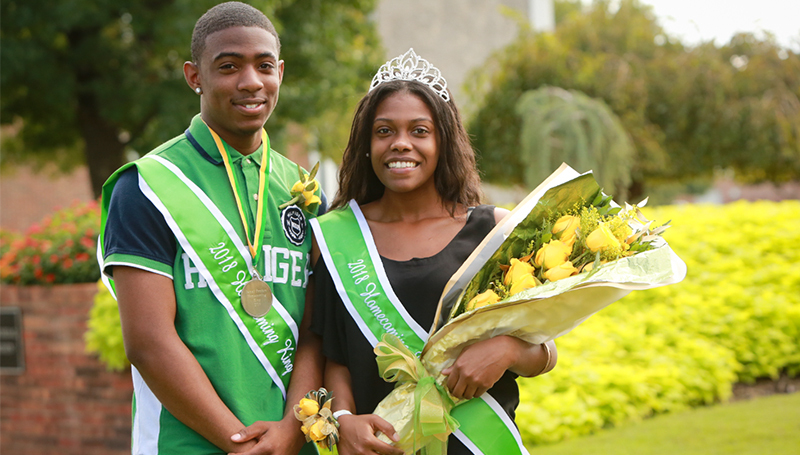 Jamal Prothro and Adrienne Silerio were crowned Homecoming King and Queen during the all-campus picnic Friday, Oct. 5, at Missouri Southern. Silerio, a sophomore social work major from St. Louis, was sponsored by the Southern Black Student Union. The daughter of Kristine Thompson and Gary Silerio, she is involved with Project Stay, the National Honors Society and the International Dance Club, and also serves as a group leader in organizations working to help young African Americans/minorities plan for college. After graduation, she plans to get her master’s degree and work in the hospital field. Prothro, a freshman biology major from Atlanta, Ga., was sponsored by the Southern Black Student Union. The son of Tomica and Leonard Prothro, he’s a member of the men’s basketball team, DECA and FCCLA. He plans to attend medical school after graduation. The King and Queen were selected during an election this week at Missouri Southern. Royalty will be recognized during halftime at the Homecoming football game at 2 p.m. Saturday, Oct. 6, at Fred Hughes Stadium. Samantha Hargis, sophomore biochemistry/pre-med major from Nixa, Mo. Rachel Ray, senior health promotion and wellness major from Alma, Ark. Taylor Erickson, senior health science/business major from Camdenton, Mo. Paige Ragar, senior nursing major from New Bloomfield, Mo. Peyton Powell, senior business management major from Springdale, Ark. Justin McKee, senior physical education major from Neosho, Mo. Rylee Hartwell, junior sociology/psychology major from Joplin. Noah Hembree, senior secondary education/political science major from Joplin.